This will be a series of posts documenting (part 1) how to more power efficiently wire a replacement LCD, and (part 2) how to interface the Nomad’s existing controls with the LCD to navigate its built-in menu and adjust its settings (brightness, contrast, saturation, & tint). 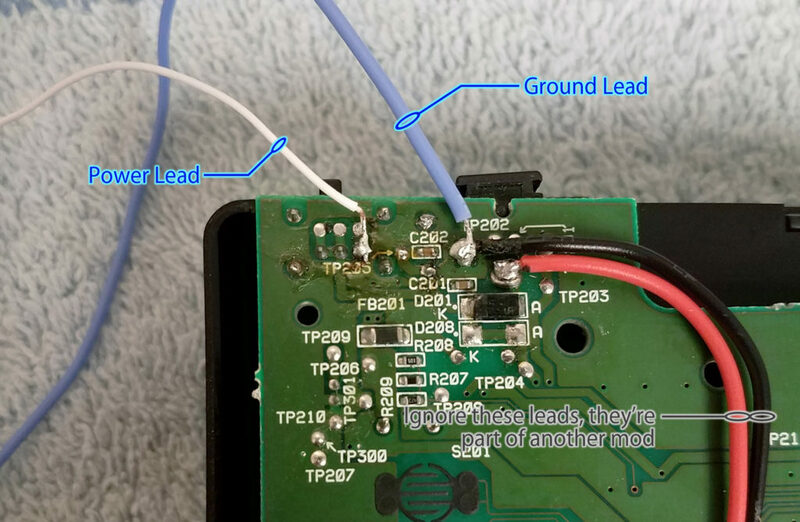 There’s no shortage of tutorials for replacing the Nomad’s LCD (1, 2, 3, 4, 5, 6), but most use the quick and dirty method of connecting the LCD’s power wires directly to the Nomad’s on/off switch. Since these LCDs usually specify a 12V input, tapping power here provides the LCD with the Nomad power supply’s full input voltage (between 7V-12V, depending on whether you’re using a battery pack or DC adapter). The thing is, the LCD panel and its driver circuit only actually need 3.3V to operate. So why do we care? The way these units works is, the driver board has a DC-DC step-down circuit built-in to reduce the input to 5V, and then a voltage regulator further reduces that to 3.3V for the LCD panel/video driver circuit. The problem is, no step-down circuit is 100% efficient, which means it’s wasting power and impacting battery life. 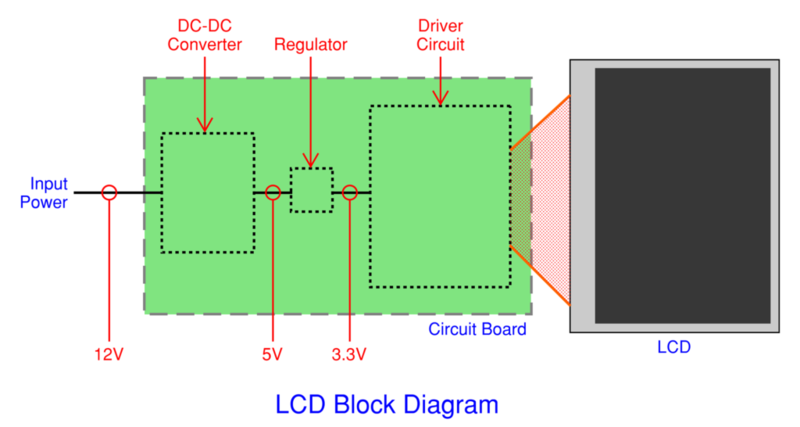 Note: Some LCDs use a DC-DC circuit that steps the voltage all the way down to 3.3V instead of 5V, so if you select a different model LCD, you’ll need to verify the circuit’s output voltage and component locations yourself. They try to bypass the converter by simply adding a jumper wire, which does not actually disconnect the step-down circuit. 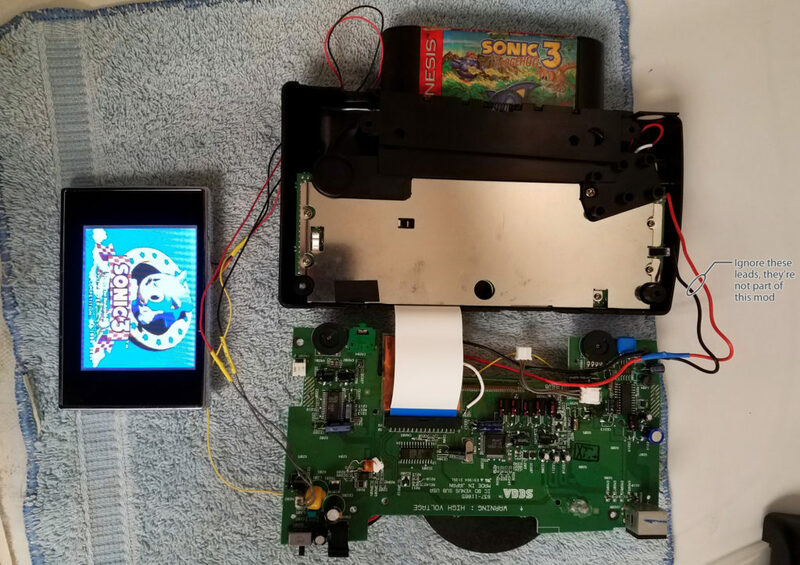 The only guide I’ve found that gets this idea right is this one by user “The Sega Holic”, but since the overall intent of this post was for a brightness control mod (see part 2), I’ll be using a different board/LCD for part two, so the connection points will be a little different. Once disassembled, I used my multimeter’s continuity checker to follow the path from the input power wire to a chip labelled “XL1509-5.0E1” (red outline); this is the heart of the step-down circuit. 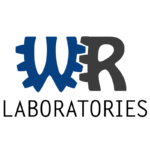 The datasheet for this chip is readily available online, and there’s even a “typical application” example wiring diagram which makes the perfect map for tracing out the components. This diagram tells us that the circuit’s output (“LOAD”) is measured across capacitor “COUT” (purple outline), which also shorts back to pin #3 (“FEEDBACK”, green circle) of XL1509. So, to bypass the step-down circuit, we need to connect our 5V tap anywhere along the yellow highlighted line. On the actual circuit board, this means either to the anode of capacitor “COUT” (blue circle), the output of inductor “L1” (blue oval), pin #3 of XL1509 (green circle), or to the input of the regulator connected to this circuit’s output (cyan circle). but there should still be enough of an improvement for this to be worth the effort. Choose one – See the “Installing The New LCD” section for more info. 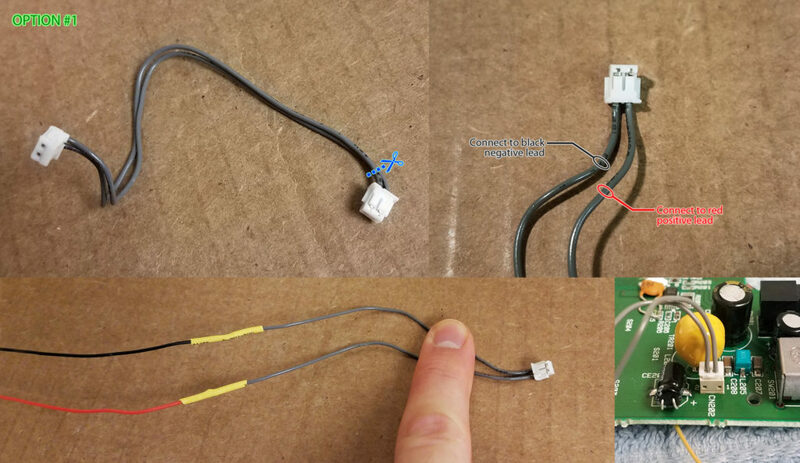 Disconnect the white ribbon cable (red outline) that connects the Nomad’s upper and lower circuit boards – alternate pulling it by each side of the blue tape and it should pop right out. Gently disconnect the cable connectors for the speaker (purple outline) and Start/Mode button pad (green outline). DO NOT pull them by their wires! These can be difficult to disconnect, but they’re easy to damage – needle-nose pliers can make unplugging them easier. Remove the three screws (blue circles) to free the upper circuit board from the Nomad’s shell – save these screws! Gently pull the upper board out of the Nomad – The red “cap” for the Nomad’s power switch (cyan outline) isn’t actually attached, take it off so you don’t lose it. I put all the loose pieces in a tiny bowl off to the side so I wouldn’t lose them. Disconnect the power cable connector for the old LCD’s backlight (red outlines) – save this cable if possible! Remove the four screws (blue circles) that fasten the old LCD to the circuit board – throw out these screws. Remove the foam cushion surrounding the LCD’s hole in the shell (green outline) – throw it out. 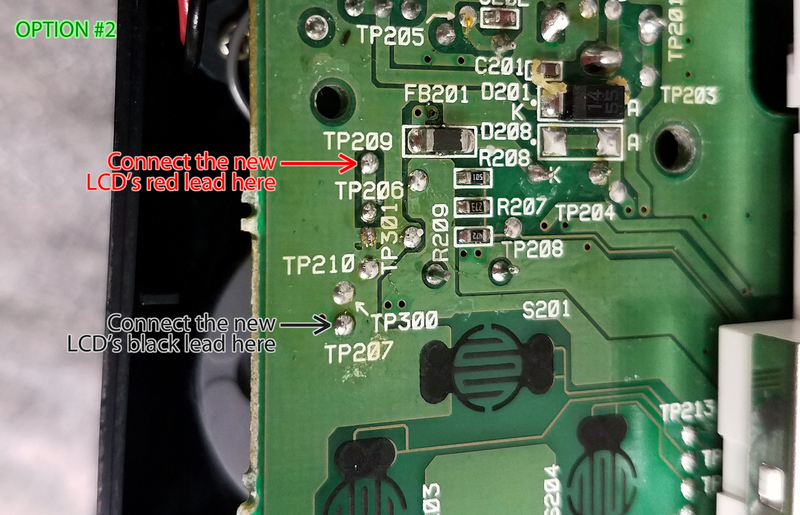 Now for the point of no return: use scissors or a razor blade to cut the ribbon cable (red dashed line) connecting the old LCD to the Nomad’s circuit board. Once this ribbon is cut, the old LCD cannot be reattached, and can be thrown out, housing and all. Ignore that the capacitors have been replaced in the right picture, I had previously replaced the LCD in my “good” Nomad, so the left picture is my “testing” Nomad. Remove the four screws on the back of the unit (blue circles) and pull the shell apart – throw out these screws. Remove the two screws holding the button pad to the back of the unit (green circles) – throw out these screws. Disconnect the cable connector to the button pad (red outline) – sit it aside for now but don’t throw it out (unless you don’t want to do the brightness control mod, then you can throw it out). Something I learned late in this project: the foam tape (blue circle) that attaches the circuit board to the LCD makes it too tall to fit under the Nomad’s circuit board (shame on me for not testing this sooner…). To remedy this, you’ll need to use a thin pen knife or razor blade to slice through the tape, without scratching the underside of the circuit board or cutting the ribbon connector to the LCD itself. The tape is soft, so it’s not terribly difficult to cut, and the metal backing of the LCD is strong enough that you don’t need to worry about puncturing it. Be careful not to put too much pressure on the LCD, or you’ll damage it. Once detached, use your fingernails to scrape off as much of the remaining tape from the circuit board as you can, and a flat razor to scrape the tape from the LCD back. Ignore that the wiring looks different here, the pictures were taken out of order. Cut the heads off the power/video cable (green dashed line). Remove the black jacket surrounding the four power/video wires (red, black, yellow, white) – I used a pen-knife to make a shallow cut along the length of the cable (cyan dashed line), then I peeled it apart like a banana. Be careful not to cut too deep or you’ll cut the wires inside. Desolder (or cut) the white wire off of the LCD board (blue dashed line) and throw it out – this is the video signal wire for the AV2 line, and we only need AV1 (the yellow wire). Desolder (or cut) the red wire off the LCD board (purple dashed line) and save it – this is the power wire for the LCD/board. Resolder the red wire to the anode of the shown capacitor (orange circle) or input pin of the regulator (red circle) – I chose the capacitor’s pin. This bypasses the LCD’s step-down circuit. Optional – Trim the new LCD’s red and black wires. I left mine long to make disassembling the Nomad easier next time I wanted to work on it, but they can be shorter if you like. Attach the red and black wires to the gray cable. Note the orientation of the connector – be sure to attach the wires as shown. If they’re reversed, the LCD won’t work (and will likely burn out). Use either electrical tape or heat shrink to cover the connection points. Plug the newly-finished connector into the board. Connect the new LCD’s red wire to pad TP209 (this isn’t the actual connector pin, but it connects directly to the positive pin, and has more room to solder to). Connect the new LCD’s black wire to pad TP207 (this isn’t the actual connector pin, but it connects directly to the negative pin, and has more room to solder to). I tried to find a replacement for the original connector in case someone needed it, but I couldn’t find a suitable match. JST’s “GH” series is pretty close, but doesn’t quite fit (this may be a proprietary Sega connector?). Optional – Trim the new LCD’s yellow wire. I left mine long to make disassembling the Nomad easier next time I wanted to work on it, but they can be shorter if you like. Connect the wire to pin TP237 on the Nomad’s upper board (under the AV output jack) – this is the AV output jack’s composite video pin. Note: Some LCDs have a separate ground wire per video line, but the original power/AV cable for this model had all grounds (power/AV1/AV2) tied together. Lay the new LCD/board to one side. Reattach the Nomad’s white ribbon connector between the upper and lower boards. Connect your Nomad to a power source (battery pack or DC adapter). Put in a game and turn it on. If you’ve done everything right, your game should be displaying perfectly on the new LCD! One last thing, the new LCD needs to be freed from its original shell. Use either your fingernail or a thin screwdriver to gently scrape off the glue, starting with the portion attached to the shell. Remove the old screen protector by applying pressure from the inside. It’s common for them to crack given their age, so be careful of sharp edges. Clean off all of the old glue – most of it should peel right off, but rubbing alcohol can help with any stubborn remains. Make sure the Nomad’s shell is clean and dry before putting the new one on – both types I listed above are self-adhesive, so all you need to do is peel off the paper and stick it on. I had already replaced my screen protector last time I replaced my LCD, so no pictures here. Sorry! First, make sure the inside of the screen protector is smudge and dust free – once you glue the LCD in, you won’t be able to clean it. I used a damp tissue to clean it, a dry one to dry it, then a blast of compressed air (keyboard cleaner) to tip it off. The LCD itself shouldn’t need to be cleaned, but it can’t hurt to repeat these steps on it, too. To best align the new LCD, put the Nomad face-down on a glass table and sit underneath it to align the LCD. If you don’t have a glass table (like I didn’t), take the glass from a picture frame and prop it up across two chairs. While lying under the glass, very gently slide the LCD around until you are happy with the placement. Optional – I removed the “Start/Mode” board from the upper half of the Nomad’s shell and reconnected it to the Nomad’s upper circuit board. This allowed me to press “Start” to enter and then pause a game. A stationary picture made it much easier to align the LCD. With the LCD aligned, shut off the system and put a small amount of hot glue on the corners of the LCD to affix it in place – the LCD is very lightweight and doesn’t need much to hold it, so don’t go crazy. 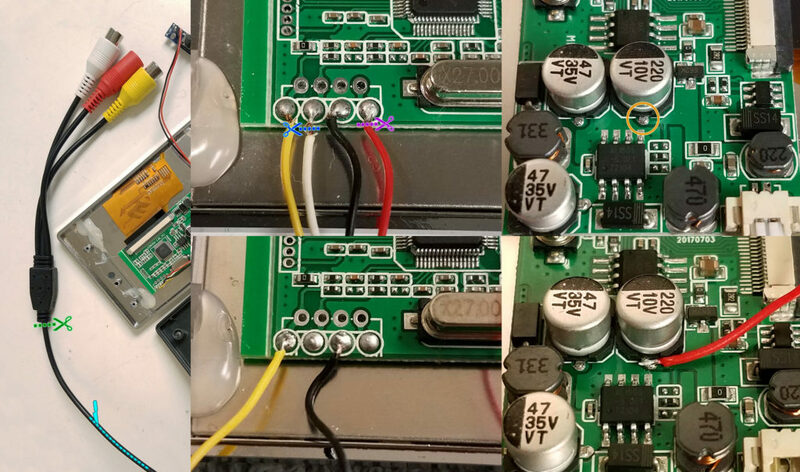 Optional – It’s also a good idea to put a little glue over the power/AV wires on the driver board (blue circles) for strain protection. 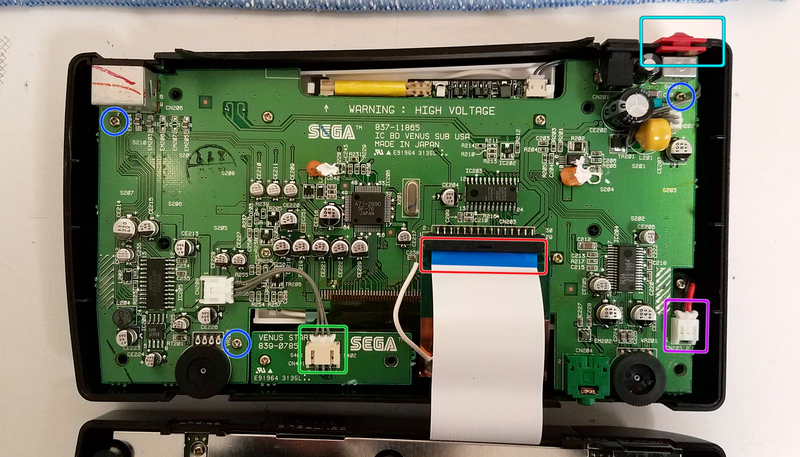 Do not get any glue on the driver board’s control pad connector port (red circle), unless you’re not doing the brightness control mod, then it doesn’t matter. Cut out a small piece of paper and place it underneath the LCD’s circuit board to insulate it from the LCD’s metal casing. Place the LCD’s circuit board as close to the top of the shell as you can and cover it with a few strips of electrical to insulate it from the Nomad’s circuit board. Reinstall the Start/Mode button pad – make sure to put the rubber buttons back in first! Pull the red, black, and yellow wires over the top center edge of the shell and let them hang outside for now. Replace the A/B/C/X/Y/Z buttons and their membranes (the gray rubber pads) if you took them out (orange circles). Put on the red cap for the power switch and carefully reinstall the Nomad’s upper circuit board (pink outline) – make sure the gray/red/black power connector wraps under the board as shown. Reinsert the three screws to finish attaching the board (blue circles). Reinsert the white ribbon cable (red outline) that connects the Nomad’s upper and lower circuit boards – grasp it by the center of the blue tape and just push it straight in. Reconnect the cable connectors for the speaker (purple outline) and Start/Mode button pad (green outline). Tuck up the red, black, and yellow wires in the slot along the upper edge of the shell (cyan outline) – put a piece of electrical tape over the spot to secure the cables. And you’re done! Pop in a game and try it out! So how effective is this method, really? To test it, I fully charged my (3000mAh) rechargeable battery and left the Nomad running until it died. With this new “bypass” wiring method, my Nomad ran for ~5hrs12min. Reopening the system, I unplugged the new LCD’s 5V power cable and temporary rewired the LCD using the “traditional” method of tapping power from across the on/off switch. After recharging the battery I let it run down again, and this time it stopped at ~4hrs42min. Doing some quick math, we see that we’re getting about a 10% increase in battery life with the bypass wiring method over the “traditional” method, which is well worth the effort in my opinion. Hopefully this guide has been helpful, and if you have any questions, leave a comment or shoot me a PM (through the form on the left-hand side). Happy gaming! The SegaHolic here. Great write up. Looks like I’m not the only one that does extensive research Googling into a project. It amazes me that some who did the screen replacement and used jumper wires to bypass the step down circuit blame the screen for “burning up” after short use. Kudos to your detailed work. Hi! glad you like my write-up, your video was useful in my research. Not sure what you mean by the “burning up” part, did someone ruin their Nomad by putting in jumper wires? Hey, I’ve ordered this screen and can’t wait to upgrade my Nomad. How is part 2 coming along? Have you found options for menu control? I was wondering if there would be a logical way for the backlight could be controlled via the contrast knob.. that’d be a neat option to have, not necessarily needing some sort of hidden key sequence to make the LCD’s menu pop up. Hello, sorry for the delay, this site’s no longer notifying me of new comments for some reason… My design for part 2 has actually been done for a few weeks now, I just wanted to give it an extended test before I posted it. I’m aiming to finish the write-up this weekend. Unfortunately this method won’t use the existing brightness dial, but instead will use the Nomad’s buttons (Mode+D-Pad) to control the LCD’s built-in menu system. I built a small circuit to monitor when combinations of the Nomad’s Mode+direction buttons are pressed and relay this to the LCD to navigate through its menus. With it, you can easily adjust the picture’s brightness, contrast, saturation, and tint. I figured it would probably be an extended version of your reset mod. Have you found that there is any generally good combination of settings that you prefer for the monitor? The defaults of all 50% seems a bit off to me. “Good settings” seems to vary depending on the game (and personal preference). Right now I’m replaying the Sonic series and I’m happy with brightness 40, contrast 35, saturation 40, tint 50, but 2 weeks ago I was playing Sword of Vermilion and had all the numbers at least 10 higher since it’s a (visually) darker game. I’ll also vary settings depending on where I’m playing. For the most part I play on the train during my commute home, but that can be wildly different lighting conditions depending on the weather and the season (I’m up north, so during winter it’s dark by 5pm, but in the summer it’s light out past 8pm). I haven’t really noticed any sharpness problems, no. Since this mod is done by tapping the output AV jack’s video signal, the picture you get from the cable should be identical to how it will look installed. It’s possible you got a bum unit? The first I got worked fine for this model, but for the previous model I tried I had three duds in a row. You get what you pay for, ya know.